OP1 44t multi-purpose 48 t/m craned artic vehicle. OP2 restricted access a 12’ short platform body added. OP3 unit only used as a mobile crane. 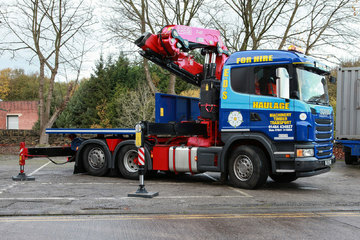 Cranage to lift a compact 9t m/c @ 5m or 2.2 @ 16.5m (from the side of the vehicle). OP1 26t rigid with 36 t/m crane 10t payload. Rear pull out for long light loads or 32’ cabins. 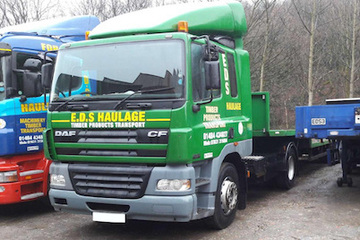 OP2 20’ flatbed drawbar with 5.5t payload. Cranage to lift a compact 8t @ 4m or 2.5 @ 12m. Cranage to lift a compact 6t @ 4m or 2.5 @ 12m. 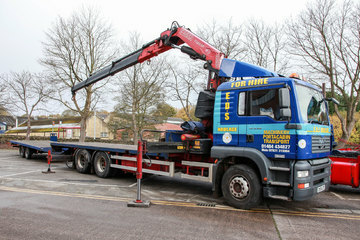 44t craned artic with a 25t/m crane up to 20t payload. 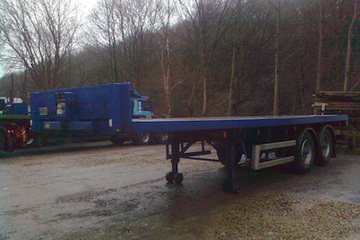 Cranage to lift a compact 4.5t @ 4m or 1.8 @ 12m. 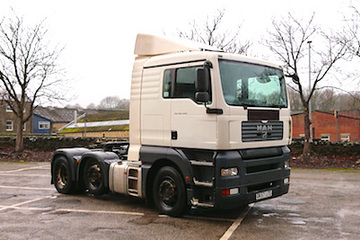 44t artic with tag axle. 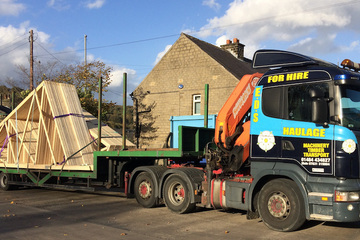 44t artic with mid lift axle. Available for traction only (unlettered). 31t artic 14t payload. 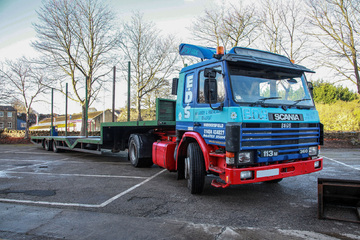 For all you classic lovers this is the last of our series 3 Scanias that our business was built on. When wagons were wagons and they were built to last! 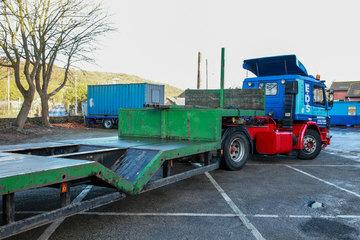 40ft purpose made truss trailer with a low bottom deck 2’10”/10.85m, with ‘V’ cut out to invert the trusses to lower the travelling height, or if the trusses are too long. Note 1: If trusses are inverted the receiving site requires an area to lay the trusses down flat to reinvert. Note 2: When inverted the number of trusses will be reduced due to the chassis rails. 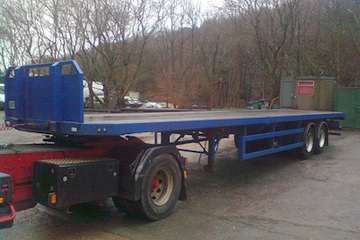 - 42ft/13m Tandem flatbed 20t payload. 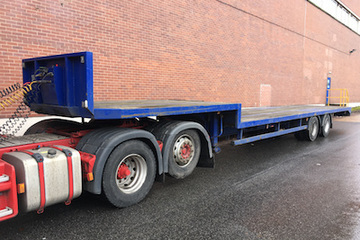 42ft/13m Triaxle step flatbed 24t payload converts to a truss trailer. 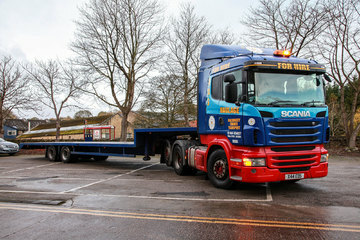 28ft/8.5m Tandem axle flatbed 15t payload for tight access. 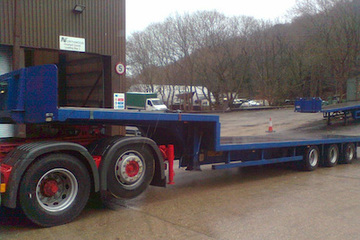 42ft/13m Tandem step flatbed 20t payload.